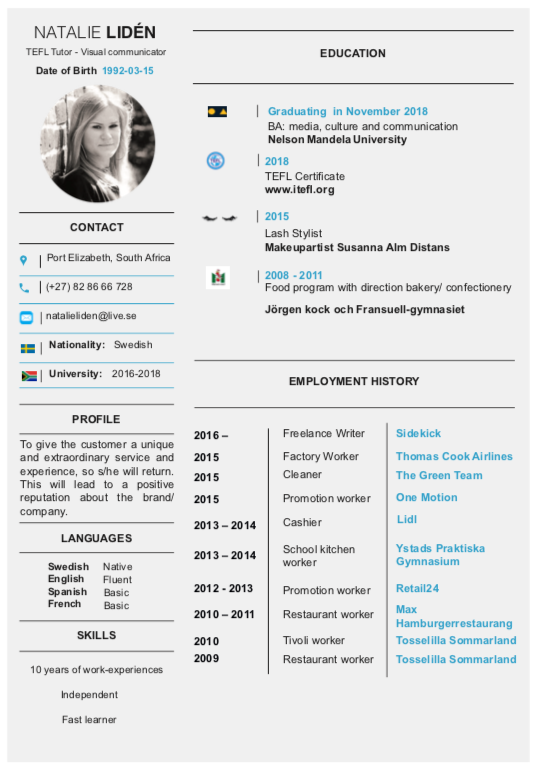 Natalie Lidén is originally from Sweden but has spent her last three years in beautiful South Africa to finalise her university-studies at Nelson Mandela University. She finalised her TEFL certificate at the end of June 2018. She is busy studying her last year of her bachelor's degree in media, culture and communication. She is majoring in graphic design and sees visual learning as very important and hope to be able to use this within her teaching. She is looking for a part-time job as an online TEFL teacher to create an awareness of why it is important to be able to communicate in the world's most spoken language, English. Since Natalie herself were born speaking Swedish she knows where many English teachers lack to understand when they teach a new language such as English for beginners. Natalie has further studied languages such as French and Spanish and has, therefore, knowledge of what tools that help students to get a clearer understanding of how the language is constructed and used in different contexts.